If you think hes ugly, wait til you see what he can do to your lawn! Grubs are the larvae of Japanese Beetles and can cause extensive damage to your lawn practically overnight. Stop Grubs Before They Start! 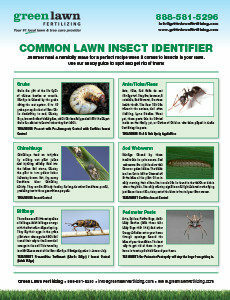 Grubs show up in well kept lawns to feed on turf root systems and once you realize they are there, its too late. Grubs – Homes in Southeastern Pennsylvania, Delaware and New Jersey are especially prone to grub infestations. There are several different white grubs that are common to these areas and can do major damage. The size of a white grub varies depending on its stage of development but all are similar in appearance: white soft bodies, brown head and six well developed legs. They will usually be seen lying on their sides as little white “C’s”. These beetles have a 12 month life-cycle which begins and ends in the early summer months. As soon as their eggs hatch these larvae begin to devour the roots of your grass until they are driven deeper into the soil for the cold winter months. As the spring arrives and the soil temperatures rise, these grubs move back to the root systems to feed before emerging as metallic green beetles starting as early as mid-June. 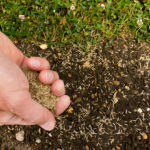 Detection & Damage – While balanced systems do need some grubs to survive and are a perfect symptom of a healthy eco-system, heavy infestations can and will destroy your lawn. Evidence of grub damage includes patches of dead or dying turf. Grubs will attack roots and destroy the plant causing the plant to brown out into large patches of spongy turf that can be lifted from the soil and rolled like a piece of carpet. It is important to note that good indicators that you may have a grub problem are infestations of Japanese Beetles during the summer months; however, infestations are not always obvious until too late. What can I do? 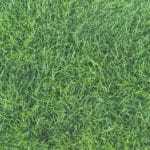 – If your lawn is infested, your lawn can be destroyed very quickly and will not recover on its own. Extensive seeding will be needed to fill in the bare patches left behind and most likely these grubs will return as beetles and lay their eggs continuing the cycle for the next season until stopped permanently. 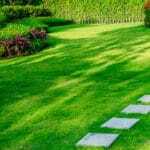 There is really only one way to ensure that your lawn will not suffer extensive damage and that is prevention. 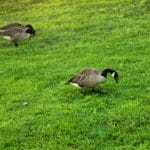 Green Lawn offers a grub control preventative for our customers that must be applied properly before beetles return to your lawn to lay their eggs. Green Lawn’s grub control, when applied by our experienced technicians, will prevent these eggs from being able to mature into larvae. By not allowing these eggs to fully hatch we are able to keep a heavy infestation down to a normal rate for a healthy eco-system. The product must be watered into the soil in order to work efficiently. We also recommend a full program of fertilizer to maintain and strengthen your lawn’s root system. The stronger and fuller your lawn is, the less damage grubs are able to cause. Green Lawn’s Grub Control is included in our Premium Program as well as aeration and seeding scheduled for the fall to help strengthen and thicken your turf. We also offer this service as an additional service to our Basic Program. Call 888-581-5296 or sign up for Guaranteed Grub Control Today!